According to the Department of Labor (DoL), ‘overtime’ is defined as time and a half pay for every hour over 40 hours a week spent working. Defined in further detail in the Fair Labor Standards Act (FLSA), the Act that defines ‘overtime’ applies on a workweek basis with a regularly recurring week that can be defined to begin and end on any day. 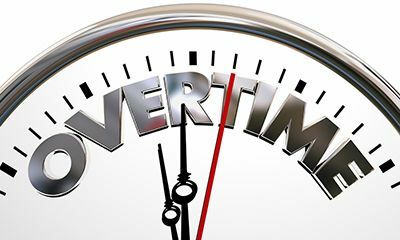 With the DoL recently revising the definition of ‘overtime’ to include some low paying white collar positions that are salaried, you may in fact be entitled to more money then what you are currently receiving. Whether done intentionally or accidently, if you are not being paid your fair share then you will need the services of an overtime attorney. Helping you navigate the confusing and at times obfuscated world of labor law, your overtime lawyer will run through various fact sheets and general guidance principles to help with your case. When it comes to having representation in court, make sure you have the full legal representation afforded to you so that you can place your best case forward. Do You Have Uncredited Overtime Pay? Are you owed overtime? The first question you should ask yourself is whether or not you are hourly. If you are hourly, then the process of determining overtime is relatively straightforward. If you are salary, then recent changes in the rules means that you may want to seek an attorney to be sure what legal footing you have. If you are hourly, then every hour worked over 40 hours a week requires overtime pay. First, determine your workweek as set by your employer. Typically, this is Sunday to Saturday, or Monday to Sunday. Sometimes the workweek may split straight through the center of the week. Once you find your start, count every hour you worked. For every hour over 40, multiply your pay by 1.5 then add to the amount you are paid for the 40 hours. Regardless, in figuring all this out you may want to retain the services of an overtime attorney. Helping you make sense of confusing laws, an overtime attorney will tell you where you stand according to the law. In addition, let our talented team provide these services for you. Do you feel as if you have worked extra hours and have not been compensated correctly for your time? Contact us today and we can schedule a free consultation to review your case.